A child is never happier than when they are playing. Their eyes light up with each trip down the slide and giggles are heard as each swing gets a little higher than the one before it. For children diagnosed with pediatric cancer, times of happiness and just letting go and being a kid are few and far between. 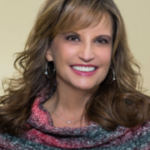 To help children and their families dealing with the diagnosis of pediatric cancer see hope in a terrible time, Roc Solid Foundation, based in Chesapeake, VA, builds playsets for children 1-8 years old and redecorates rooms of kids 8-18 years old. Roc Solid Foundation founder, Eric Newman, himself a survivor of liver cancer when he was 3, took his love of construction and his passion to reach out to children like him when he was young and combined them to begin building playsets and redoing rooms. He started in 2009, and has over 400 “Play It Forward” projects completed to date. The organization expanded from their home base of Virginia to North Carolina in 2017 and recently did their first playset build in Winston-Salem, NC, for Abby Keating, a 3-year-old, diagnosed on September 7th, 2017, with Acute Myeloid Leukemia (AML). Abby’s treatment began immediately at Brenner Children’s Hospital with chemotherapy, which depleted her immune system and put the family in isolation at the hospital. Abby had a feeding tube to help with nutrition, lost all her hair, but rang the bell at the hospital, recognizing her last treatment on December 20th, 2017. The Keating family welcomed a new baby daughter, Caroline, just two days before Abby completed her treatments, so the Keating family of 4 now, all went home together! “Abby was nominated for a Roc Solid playset by a friend who reached out to the organization. 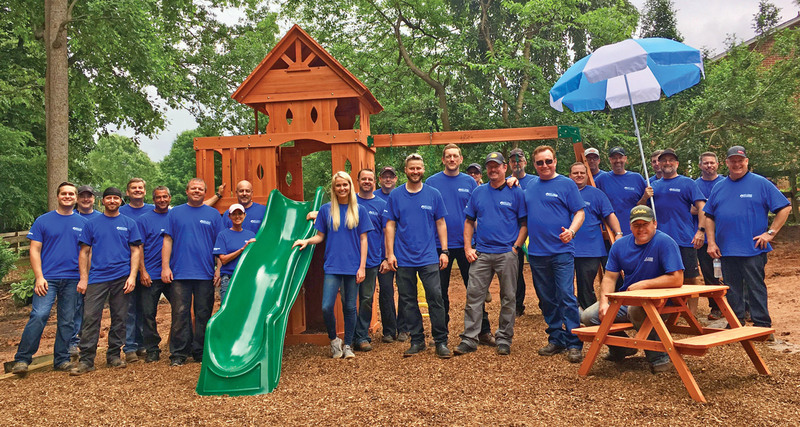 Roc Solid worked with the Child Life Specialist at Brenner and set up the build of the playset, which was sponsored by Richard Childress Racing. The morning of Abby’s playset build, they arranged for a limo to pick us up along with some of our friends and go out to breakfast, followed by a trip to Build-A-Bear, where all of the kids were able to make their own bear. At noon, we headed back home for the big reveal. Abby had no idea while we were gone that the playset that she had wanted was being built. We got out of the limo, walked the red carpet, carrying Abby with her eyes covered, to the backyard. Abby was shocked at first, but [then] the biggest smile came on her face! It was amazing! All she wanted to do was play. But Roc Solid did more than build a playset for Abby. Knowing that the founder, Eric Newman and the local coordinator, Kara Bonvillian, are both cancer survivors, gave us as parents hope for Abby’s future. Now, Abby, just turned three, and her sister, who is six months old, love to play together, and I can envision many, many years of us looking out our back window and seeing them play together along with their friends,” said Michelle Keating, Abby’s mom. Roc Solid Foundation also reaches out to families in another way, too. “Many times when families get the diagnosis of cancer for their child, they immediately are checked in to the hospital, not able to return home. We provide Roc Solid Ready Bags to families, with items like toiletries, a journal, debit cards, coins for vending machines, a tablet…everything needed for an unexpected stay at the hospital. We feel these bags let a family know that they aren’t alone in this journey; we want to bring them hope. We’ve recently started building outside of Virginia, and have completed playsets in the Charlotte and Raleigh-Durham, NC, areas, working with Levine Children’s Hospital and UNC Children’s Hospital. A playset is really a simple concept, and people might say, ‘Why would a playset be needed when a family is facing cancer with their child?’ With the playset, we are able to restore a bit of what is normal for a child, playing and having fun, during a time when nothing seems right to the child or their family. If we can help a child and a family set cancer aside and just focus on the enjoyment that comes from one day, then we’ve made the difference we want to make,” Ashley Martin, Director of Communication, Roc Solid Foundation, commented. For more information on Roc Solid Foundation and how you can apply, donate or sponsor a project, visit www.rocsolidfoundation.org or e-mail Kara Bonvillian at kara@rocsolidfoundation.org.